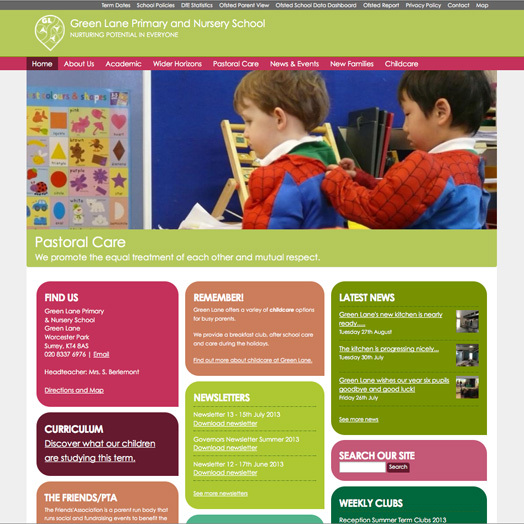 Green Lane Primary and Nursery School is a local state school. The school needed a new website as their previous site did not provide the flexibility and ease of use that they required. I worked with Headteacher over period of months and together we introduced some innovations for the school. Foremost of these was the use of social media to extend the school's reach and to improve communication with parents and carers. "It has been both an education and a pleasure working with Tristan to develop our website. Tristan's attention to detail has ensured we have a site which exceeds our expectations and initial requirements. We are extremely pleased with the result!" A full calendar system, allowing the site administrator to post events to a central calendar and specific calendar items to certain pages. A news section which posts news items to Facebook and Twitter automatically. A series of document libraries, including school policies, newsletters, curriculum documents and information on weekly clubs. Documents are posted to the site from a single custom screen which further simplifies Drupal's content posting pages. The use of Facebook tabs on the school's Facebook page. Content is drawn from the school's site and is updated automatically when the school's site is updated.